Ah, the problems that technology has created in my life and how it affects my style…. I am sure all of you have fashion/technology problems:) I have recently acquired an iPhone (LOVE it), but it is a touch screen and this is a problem with my wide selection of beautiful gloves. My hands are freezing just so I can call my awesome boyfriend (he is sitting here so I have to give him a shout out!). Lucky for me, I have a mother that knits constantly and is always looking for reasons to make me something. She recently stumbled upon a pattern for fingerless gloves and little did I know, this would literally alter my fashionably freezing life. Finally, I can be warm and use my touch screen phone all at the same time!!! 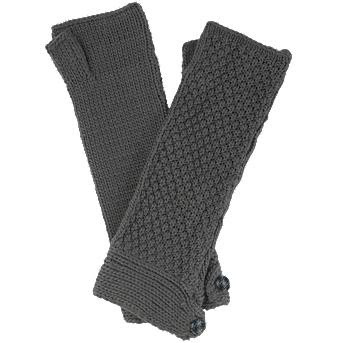 Don’t worry if you don’t have a mother who is knitting at every waking moment of her life, there are plenty of places that you can buy your own fabulous pair of fingerless gloves! Never be left out in the cold again, dial away and be cute and cozy doing it. Thanks mom. I know it is freezing outside, I live in New York City, but let’s at least think warm. Let me set the tone… It is a crisp, sunny day. The birds are chirping, mother’s skip with their children down the street and I twirl round and round through the park enjoying the fabulous day a la Mary Tyler Moore. I am also 5’9, 125 and resemble Stephanie Seymour…. Hell, it is my sunny fantasy! Dreaming of warmer times only makes me brace myself for Spring shopping. I adore the Spring scarf, it is a representation of the hot months to come. It is a transitional piece that has many lives because it can be worn both indoors and outdoors. It instantly creates a messy bohemian look that would easily make Mary-Kate Olsen jealous. Plus, it is a simple way to put your own stamp of style on your outfit. Be creative and be you. 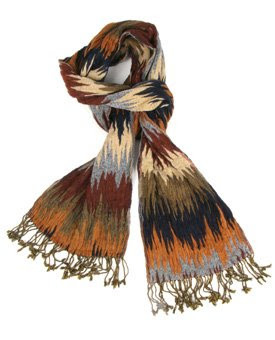 This easy and fun scarf reminds me of Missoni without the hefty price tag. At $85 it isn’t cheap, but it rocks neutral tones that can really be worn with most basic looks and different styles of jackets. You can be a sophisticated bohemian, when mixing it with long gold chains and simple studs or be an earthy bohemian with mixed gold, wooden, and beaded bracelets. Throw on a huge pair of hoops to top of the outfit. Scarves, like jewelry, are a quick fix to the age old problem of, “I have nothing to wear!”. Yes you do. We already know that this is Tina Fey’s year, even if she isn’t in any movies! She is the toast of Hollywood right now and why not celebrate her even more by making her a presenter at the Oscars to crack us all up yet again. Seriously, her and Steve Martin were pretty funny. Now, not only is it Tina’s year because of her comedic talents, but talk about turning into a grade A hottie! (Reference to her movie Mean Girls for those that need a Tina Fey lesson:) I was about to give up on her and the whole “black dress everywhere” thing, but then she came through! I will commend the ladies on the Oscars red carpet this year, but Tina is still a fairly new addition and definitely took her own style up a few notches with this stunning gold number. Not only did she stand out with glamor and grace, but she showed that she is a true fashionista. This shimmering gown was obviously a perfect fit for such an event, but let’s talk about the actual fit…. Amazing. Her body looks rockin’ right now and there is no better reason than the Oscars to show it off. I love the deep V neckline mixed with the fishtail bottom. It accentuated her curve in all of the right places. The thickness of the arms mixed with the deep V highlight her small waist and the curve of the fishtail makes her booty extra juicy! Yes, I seriously did say that. The finale of her easy and loose up-do mixed with simple jewels truly let HER shine on the red carpet. She wore this frock, the frock did not wear her. Keep it up Tina, I have a feeling you might rule this awards show as well very soon…..
Every awards show has got to have a princess and this Oscars season, we’ve got SJP. I LOVE this gown. Often times this ballroom gown look is just overdone and gaudy. Sarah Jessica managed to look effortlessly sheik and sophisticated. Even the over-excess of tulle could have easily thrown her onto the worst dressed list, but yet again, she has wowed her fans (I include myself:). Although it was difficult to tell on camera, the color of this dress was actually a light green sea-foam. What a perfect color choice to go along with the 50’s bodice style of the gown. The intricate beading done on the top half of the gown, mixed with the very straight forward tulle bottom half was a complimentary combination. It was truly not too overdone. The simple satin belt was the right cinch for her tiny waist and really gave definition to a very BIG dress! Oy. I can think of no other word to describe how truly unfortunate this choice was. 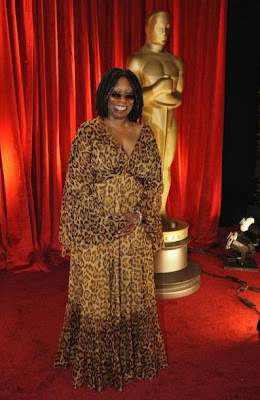 Oh Whoopi, yes I watch The View and I know that wearing a dress is not your thing, but God help the animal kingdom. You are lucky you wore this walking the red carpet and not at the Bronx Zoo, it may have been an even bigger disaster! As followers of this blog, you may re-call a recent post about how to wear animal prints. I noted that draping yourself in such a pattern is a BAD choice. Case in point, I give you Whoopi Goldberg. It appears that she was not sure if channeling a peasant girl or a lady tigress was the right choice, so she chose both. If ABS remakes this dress to sell to the mass public I am going to scream. And not in the good way I did about Heidi Klum’s awesome gown. Ladies, take it from Whoopi, stick to a pant suit if that is your thing…. Not everyone is made for a dress!!!! !